At a point in a strained material, a direct tensile stress of 60 N/mm^2 along x-direction and compressive stress of 40 N/mm^2 along y-direction are applied on a plane right angle to each other. Question: At a point in a strained material, a direct tensile stress of 60 N/mm^2 along x-direction and compressive stress of 40 N/mm^2 along y-direction are applied on a plane right angle to each other. At a point in a strained material, a direct tensile stress of 60 N/mm^2 along x direction and compressive stress of 40 N/mm^2 along Y direction are applied on a plane right angle to each other. 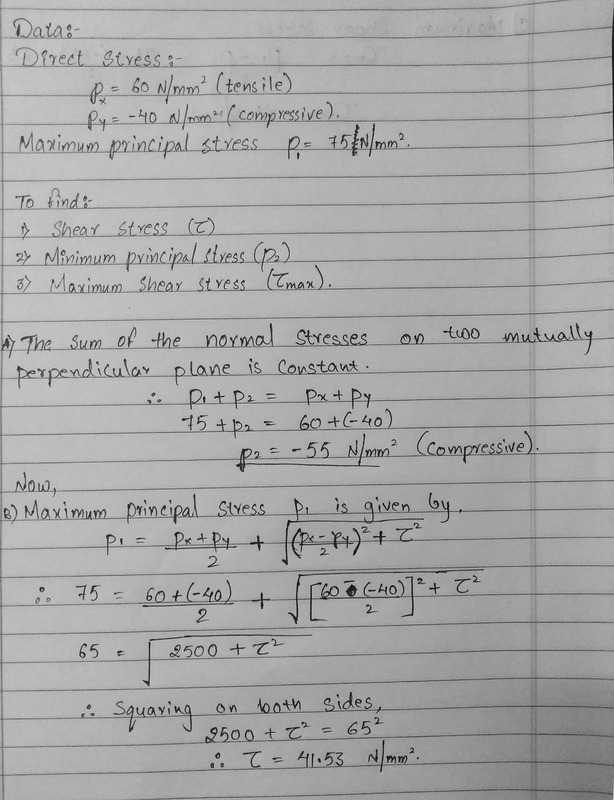 If maximum principal stress is limited to 75 N/mm^2. Find the shear stress that may be allowed on the plane. Also find minimum principal stress and maximum shear stress.